AleaSoft, October 4, 2018. Once the barrier of $80 is broken, the price of a Brent barrel oil seems to have no ceiling and has already exceeded $85. In the Iberian Peninsula, the arrival of autumn registered a decrease of the temperatures and also of the electricity demand. 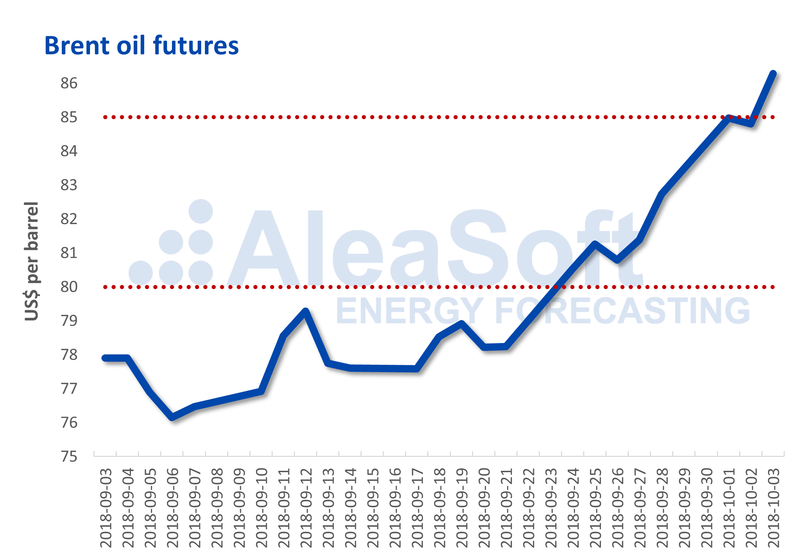 AleaSoft forecasts indicate that the demand will continue to fall next week. For four months, since May this year, the price of a barrel of Brent oil was hovering around $80 without surpassing it at any time. Even with some bumps and falls of up to 7% in a few hours. But once the barrier was overcome on Tuesday, September 25, the bullish run remains unstoppable, and has already exceeded $85. 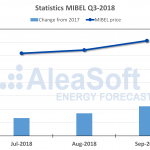 According to data sources consulted by AleaSoft, the price may continue to rise in the short term, but the average for the last quarter of 2018 would not approach $100. Source: Prepared by AleaSoft using data from ICE. The forward prices of gas, coal and carbon emission rights continue at high levels. According to AleaSoft, this is due to the expectation of a possible critical situation during this winter, where an episode of low temperatures would trigger the thermal production with gas and coal due to the low nuclear availability throughout the continent and the reduced water reserves in the Nordic countries. 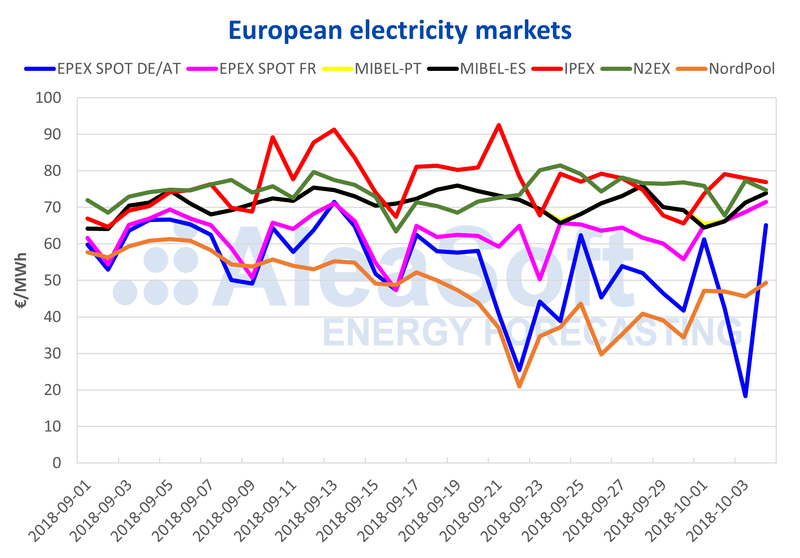 In recent days, the prices of the main European electricity markets have been located in the higher band, between 70 and 80 €/MWh. The exception has been the Nordic countries, which continue in their privileged position of lowest prices in Europe, and Germany, which in addition to having a holiday, and consequently less demand, has also registered high wind energy production. Electricity futures in European markets continue at high levels encouraged by fuel and carbon futures. But the price of the Belgian electricity futures clearly stands out, since the monthly product for November reached 181.00 €/MWh. It is expected that in November only one of the seven nuclear reactors in Belgium will be available, which puts its electrical system at risk of blackouts, and when availability is low the prices go up. In recent days, temperatures have already been at historical levels for this time of year, after more than two weeks of being clearly above, almost 3°C more on average. This drop in temperatures also led to a 2.5% decrease in electricity demand in Spain. Looking ahead to next week of October 8, temperatures are expected to continue to fall, and, according to AleaSoft forecasts, the reduction in electricity demand would be around 4.5% in the mainland territory. On Monday, October 1, 221 GWh of wind energy were generated in mainland Spain, a peak that exceeds the one registered the previous Monday of 205 GWh. Such a value of wind energy production was not reached since May of this year.